How do we learn anything new? The sketching highlight of the summer for me has been the Urban Sketchers 3 day workshop, ‘Pushing your Sketching Boundaries’ in Oxford. I was quite apprehensive before I got there, thinking I had put myself in a group that were far more advanced – all the usual anxious fantasies that everyone else would be brighter, shinier, more talented, successful etc. etc. As it turned out, some of them were indeed just that, but on the whole I didn’t stand out as particularly incompetent. In fact, it was a great experience, and certainly did what it said in terms of pushing my own boundaries. As a workshop it had some interesting characteristics that set it apart from the counselling/psychotherapy workshops that I am used to. Right from the start we were assigned groups and given a timetable. No options, no negotiations. I was happy to comply, pleased that it was so well organised – but the expectation that we would work through both the morning and afternoon sessions without a break was a step too far. (After years of group therapy my concentration span is fixed at an hour and a half!) Not that there was any problem in wandering off to grab a drink from the many coffee shops around, but I was consciously trying not to follow my default pattern of group rebel! But the most fascinating thing for me was the teaching style. I am so used to… ‘ perhaps I could suggest? or… ‘that’s a very interesting way of looking at this, but I wonder if we can refocus upon the topic here?’ or… ‘let’s try to let go of what we think we know for a moment and look again’… and so forth, all set in a context of choices and options. Here we were told what to do, given a time frame and were expected to get on with it! There was a big cultural factor at play: the tutors were all Spanish and although their English vocabulary was fine, they weren’t fluent in the English ways of ‘not saying what you mean’. Recognising the cultural difference was helpful in restraining my inner rebel, and the outcome was that I ended up doing a lot of things that I didn’t want to do. How else do you push boundaries and learn anything new? For all the circumlocutions and massaging of egos that might go on in some of my own workshops, I know that the key learning experiences come out of discomfort. Staying in the comfort zone gives security, not growth, and at some point has to be challenged. For that reason I always include some form of role play. I can hear you groan! Yes, I know, so many people hate it … but guess what? In the feedback it is always the most cited example of what has been useful learning. And as the tutor this is the point where negotiation ends. This is what we are going to do, and even if we have to wait for ‘volunteers’ for an uncomfortable length of time, we are doing it! Do we ever expand our horizons by staying in a familiar and safe place? We need to find a balance between security and discomfort if we are to learn – too much of either can paralyse our capacity to grow. So in the end I learnt a lot from having to draw in ways I don’t like, which I am not ‘good at’, whilst standing in public places feeling uncomfortable and exposed. 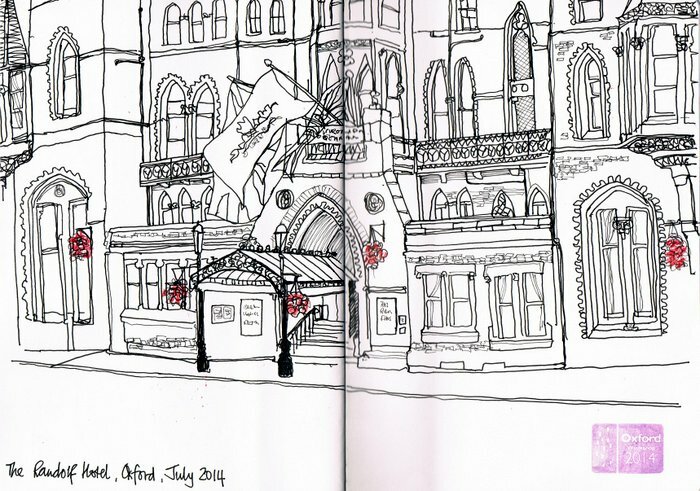 I was really pleased with the sketch at the top of the page – not my usual style at all! The tutors all worked hard to give us individual attention and helpful feedback, and gained our appreciation and affection in the course of the 3 days. 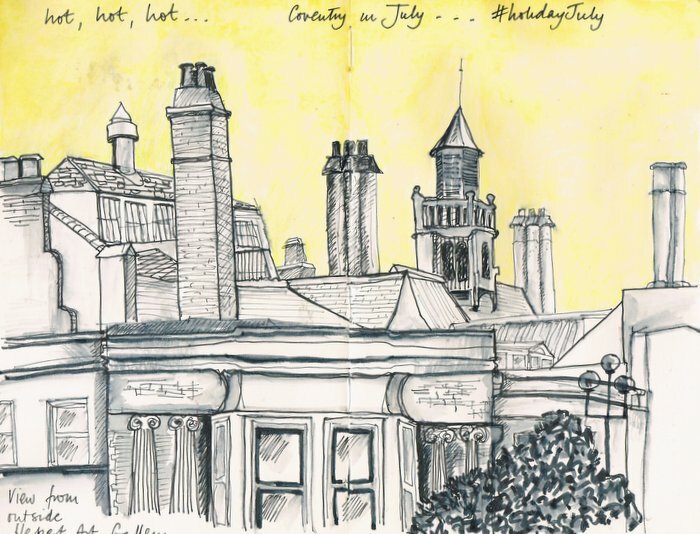 In fact, we were so inspired that a group of us are now getting together to organise a day’s sketching in Coventry, and even playing with the possibility of an Urban Sketching workshop here in 2015. This entry was posted in Uncategorized and tagged challenge, learning, Oxford workshop 2014, pushing boundaries, security, teaching style, urban sketching on August 9, 2014 by Chris.